Two tiers make an eye-catching presentation and save table space, while the rustic pine trays and steel wine barrel hoop add vintage charm. Take serving to another level. Prized appetizers at the top; assorted goodies on the bottom. Perfect! 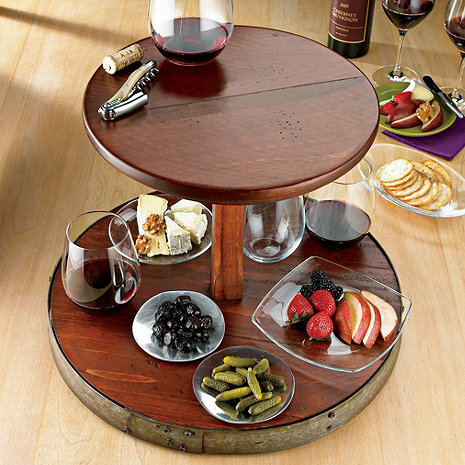 Two tiers make an eye-catching presentation and save table space, while the rustic pine trays and steel wine barrel hoop add vintage charm. Trays spin together. Are the tiers removeable to use only one at a time when needed? BEST ANSWER: Yes, the top and base are 2 pieces and the little stand in the middle screws into both. There would be only a small hole in the middle of the base, which can be covered up by a plate, etc. The top part spins with bottom - so not intended to use separate. Are the metal dishes integrated into the bottom board? Are they sold separately, and if so under what name? BEST ANSWER: No, those are just props. We bought it as a gift for my wife's brother & sister-in-law, their birthday is a week apart. They use it all the time & they get complimented on it all the time. We've seen a few times now and it is a very good product, not made cheap. The top tier of the lazy Susan was so lopsided that I was not able to use the item. This product clearly was not inspected before the fabricator sent it out. Wine Enthusiast's customer service was great, and I promptly received a refund. The item was so unusable, that Wine Enthusiast didn't even have me return it. So, two thumbs down for the product, but two thumbs up for WE's customer service.